"The former enemies of North and South are united again in common defense of their Aryan birthright." Birth of a Nation is a problematic film in many ways. It is of undeniable historic importance, both in the film industry and in American culture. It was the first great historical epic, a masterpiece of filming and editing, and was the highest grossing silent film ever; it also was responsible for the resurrection of the Ku Klux Klan in the early 20th century. At the same time it is gooey historical melodrama cloaking a socially abhorrent political statement, making an indefensible package. This sweeping three-hour epic, based on Thomas Dixon's notorious book The Clansman, covers the American Civil War and Reconstruction from a decidedly southern viewpoint. If you thought Gone with the Wind was racially insensitive, you ain't seen nothin' yet. Two families, the abolitionist Stonemans from the north, and the genteel slave-owning Camerons from Piedmont, South Carolina, are the focus of this film, and we follow them through their adventures in the war and after. An integral part of the second half of the film is the attempt to justify the existence of the Ku Klux Klan as a necessary means to remedy being "crushed under the heel of the black South." The director, D.W. Griffith, was the son of a Confederate officer and as this film makes clear was himself a thoroughly un-Reconstructed southerner. The blacks in this film (other than the faithful Cameron family retainers) are the grossest of stereotypes and often are presented as something decidedly less than human. The southern whites are all presented as saintly heroes while most of the northern whites are reduced to cartoon scalawag figures. In particular, the Stoneman patriarch, an abolitionist senator, is treated as a hypocritical buffoon. Loosely modeled on Senator Thaddeus Stevens, Stoneman wears an ill-fitting wig from which his daughter is constantly picking nits. His one aim seems to be to force racial intermarriage on the south, while he reacts in horror to his mulatto protégé's desires to marry Stoneman's own daughter (Lillian Gish). Stoneman also is shown early on lusting after his mulatto maid (Mary Alden). Alden for her part wildly overacts and mugs at the camera to the point of inducing nausea; the other performances are acceptable, within the constraints of the stick-figure stock characters they are given to work with in the screenplay. While the politics of the film are execrable, and its plot thin and sappy, there is no denying that Griffith was a master of his art. The battlefield scenes are cut together in a thrilling manner, and the centerpiece of Lincoln's assassination is extremely well done. Even though we know what will happen, the sense of fate inexorably creeping toward the destined moment is well-wrought and greatly moving. The dual last-minute rescues are expertly cut together to heighten suspense in a way that puts the similar concluding sequence in Return of the Jedi to shame. I watched this film in conjunction with a reading of the memoirs of Griffith's assistant cameraman, Karl Brown, and it was fascinating to see how the moments that seemed disjointed, pointless and wearisome to film were perfectly edited into the seamless and moving tapestry of this sprawling movie. Birth of a Nation is clearly intended to appeal to the lowest common denominator, and that it certainly does well. It is hard to imagine how the same man who made this obnoxious, hate-filled film could turn around immediately and make the plea for brotherhood and understanding that Griffith did in Intolerance (1916). Apparently that tolerance did not extend so far as to black Americans; this attitude has, I fear, irretrievably spoiled my fondness for Intolerance. Image Transfer Review: This is a DVD version of the 1992 Laserdisc release produced by David Shepard. A tinted original print owned by Blackhawk Films was used as a master, and although restoration was reportedly done, I fail to see any evidence of that restoration. Nearly every frame of the picture exhibits damage of one kind or another. The damage is particularly severe near reel changes, with breaks, jumps, splices, tears, scratches, blots, speckling and all manner of other damage, making this film very difficult to watch. A certain amount of damage is to be expected, since we are talking about a film from 1915 and precious few films of that time period survive at all. However, when we see clips in the documentary, they are almost all in better condition than the film presentation itself. Clearly there had to be a better master out there. The tinting is also questionable at times; some scenes are tinted blue and appear to be taking place at night even though the context is clearly meant to be daytime. Chapter 5, 75,000 Volunteers, is a good example of this. A few segments meant to be by firelight are tinted a dark red and are only legible at brief moments. While I suppose that the colors of the tints need to be respected if this is indeed an original release print, the red at least should have been lightened to the point of allowing something to be made out. The image appears to be slightly cropped at the top, since not all of the ornate title card is visible. The same problem appears sometimes, but not always, on the left side of the screen. Better care should have been taken in framing this picture. All in all, this disc is a pretty disappointing viewing experience. While a long ways ahead of the public domain VHS version I've seen of this film, the quality was far from satisfactory, even taking into account the age of the film. Audio Transfer Review: The sound is limited to a recent orchestral recording of the original score produced in collaboration with Griffith himself. The sound is clear and noise-free throughout, although the performance leaves a lot to be desired. In particular, during the Ride of the Valkyries segment where the KKK rides to the rescue (yes, Apocalypse Now was 64 years behind the times), there are numerous sour and wrong notes hit by the brass sections. I had to shake my head in disbelief at what I was hearing here. The sound was overall thin and compressed-sounding. However, the use of the original score is a definite plus. Karl Brown recounts that the theme used in the battle sequences was sung throughout the filming of these scenes by Griffith, so it is very clear that the director knew exactly what he had in mind for the score. Extras Review: There are not even any cast or crew credits on this film, because the print is from the original theatrical release, where a pamphlet was apparently handed out to patrons. Unfortunately, that pamphlet is not reproduced here, so anyone wanting cast and crew information without visiting the IMDb is out of luck. The sole extra is a 24-minute documentary on the making of the film and the influences it has had upon the motion picture industry and American society. This documentary, narrated by David Shepard, is extremely well done and does a fine job of putting the film in its social context. 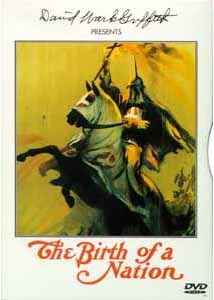 In particular, the rebirth of the KKK in the early 20th century is closely linked to the success of this film and the recognition that such racist claptrap could find a paying audience. As noted above, the film clips are mysteriously in better condition than during the main presentation. I wish that some effort had been put into restoring this important film. The documentary is essential to viewing the film and succeeds admirably on this front. Birth of a Nation is not recommended for the impressionable or the easily offended; its racial attitude is nothing less than reprehensible. However, it is required viewing for students of film, and of editing and silent films in particular. The presentation on this disk is sadly not what would have been hoped for. Perhaps film students will get a restored release sometime in the future.